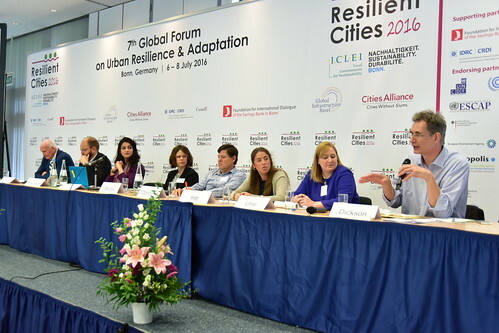 UCCRN presented at the ICLEI Resilient Cities Congress in Bonn, Germany from July 4th – 7th 2016. The Congress was attended by 320 participants from 45 countries, with approximately 150 speakers in 34 sessions. An ARC3.2 panel discussion was hosted by Somayya Ali Ibrahim, International Program Manager at UCCRN, and Chantal Pacteau, Co-Director of the UCCRN European Hub, followed by a networking session. Panel members included Dr Sean O’Donoghue, Co-Director of UCCRN’s Durban Knowledge Hub, who addressed the the necessity of basing management decisions taken within eThekwini Municipality on a foundation of solid science knowledge. Subsequent to the conclusion of the panel discussion, the Knowledge Hubs in Durban, Rio de Janeiro and Paris committed to work together to produce a funding proposal to the Belmont Forum (a group of the world’s major and emerging funders of global environmental change research) to develop scientific understanding of the importance of nature-based solutions in addressing climate change. Another proposal will centre around analysing city contributions towards a country’s Nationally Determined Contributions as outlined in the Paris Agreement analysis of city contribution towards national government Nationally Determined Contributions towards the Paris Agreement. In both these pieces of research, key emphasis will be placed on the importance of knowledge shared by various stakeholders in interdisciplinary partnerships. Durban Adaptation Chapter, a key partner of UCCRN through its Durban Regional Hub, also attended the congress, and more information can be found about it here.